← Is Your "Big But" Getting in Your Way? 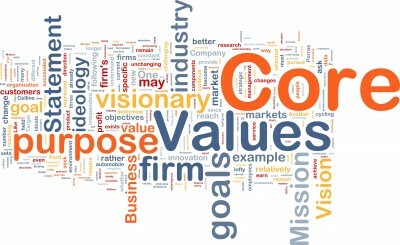 Here is a test: What are your core values? Quick now, write them down. Can’t do it, can you. At least, most people cannot. You may say, “My values are implicit; I’ve never written them down.” “Well, I try to live by the Golden Rule.” (Really? What about the people who don’t want to be treated the way you like to be treated?) You probably can recite the values of the organization for which you work more readily than you an cite your own core values. Core values underlie who we are, what we do and why we do it – even if we are unaware of our guiding values. When we stay “true to our values” others can determine that we represent exactly who we say we are. Therefore, being cognizant of and intentional about our values is important. Values are the source of integrity. Living a value-driven life requires courage. Yet, very few individuals really have considered the values around which their character, behavior, decision-making, priorities and plans are determined. Seth Godin recently asked us to “Meet the ethical placebo: a powerfully effective faux medication that meets all the standards of informed consent.” I think this well-known medical research practice, which Godin abstrusely connects to marketing, also might apply to values, however. That’s why I encourage people to try practicing a “Value a Day“. Whether the value is real for you now or not, intentionally focusing your daily choices with a specific value in mind will eventually lodge that value at the core of your being. In other words – whether you are known for them already or aspire to them daily – Core Values are your ticket to The Intersection of Purpose and Now. This entry was posted in authentic, business ethics, core values, ethics, integrity, Value a Day, values. Bookmark the permalink.